Learn how to make Terrarium with this handy youtube video tutorial. Check out all these incredibly awesome ideas now. We know you are going to love what you see. 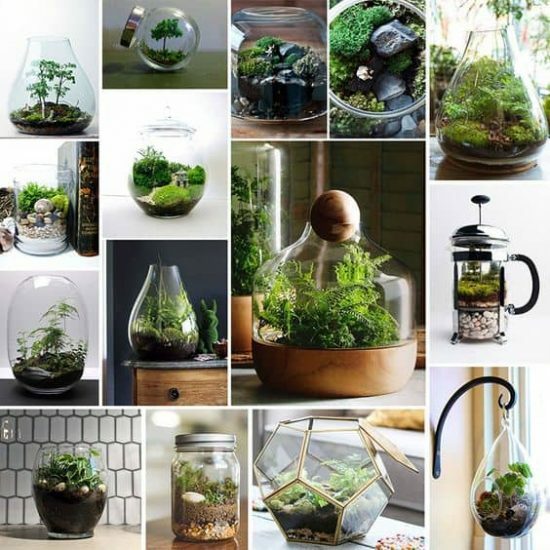 Terrariums look beautiful in your home and there are so many options to make them easily and inexpensively. A glass bowl is a great base and you can see all the individual layers. 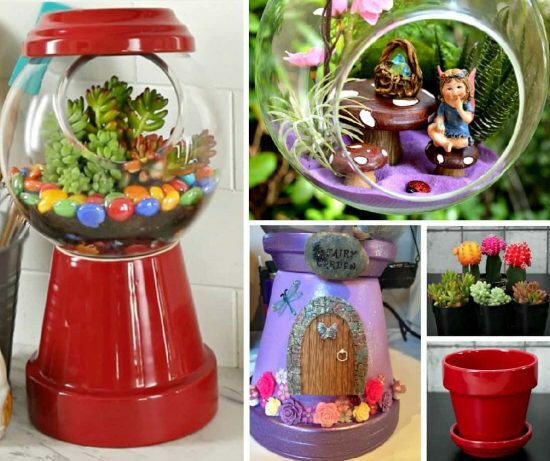 You can also create the cutest fairy gardens. Plant them out with succulents, pebbles, marbles, in fact, anything at all. It’s a great opportunity to showcase your creativity and you will be able to enjoy them forever. 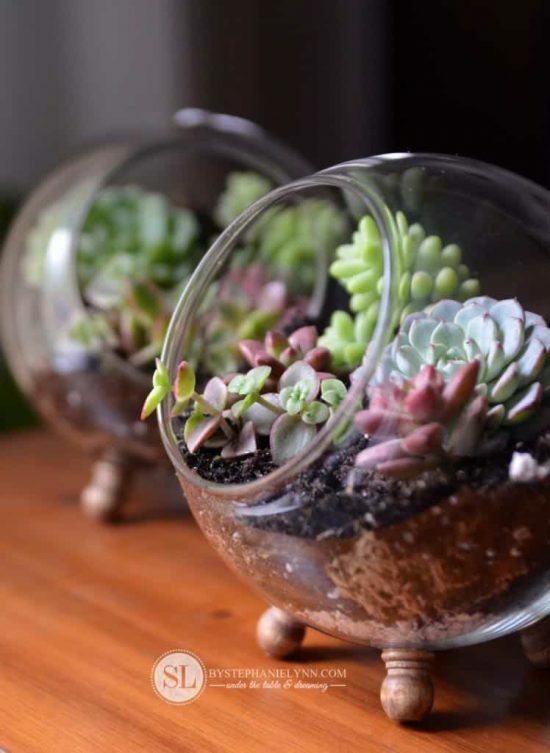 You can even use fake plants like these succulents we found on Etsy if you prefer. 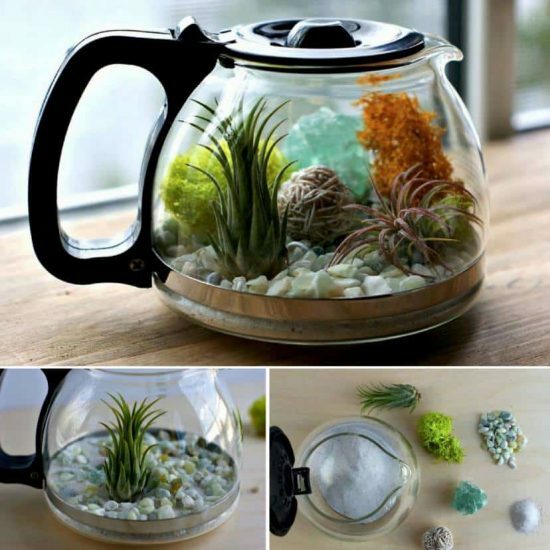 There are so many ways to make your Terrariums. Their versions show you the sort of effects that you can achieve and should have your creative juices flowing! While you’re here be sure to subscribe to their magazine. If you lack light in your home, and find it hard to grow plants, maybe you should consider felt succulents. They are so realistic and are hugely popular on Etsy. It’s easy to see why and there’s zero maintenance. You can view here. Here’s an excellent infographic from Fix and it shows you the correct way that you should layer your terrarium. They suggest using activated charcoal at the base, pea gravel as the next layer and then textural moss above. Next you will layer some good quality potting soil and then some top dressing. At this point you are ready to add your decorative items and then the plants of your choice. These beautiful examples from Stephanie Lynn are truly stunning and they will liven up all your favorite spaces in your home. They are perfect if you are a bit of a brown thumb. Just remember, succulents are desert plants. As a result, they need very little water. Do not over water them as they will go leggy. As you can see from this image from Star Online you only need a few things to get your Terrarium started. A water bottle spritzer is also preferable to a hose as the plants that you will be using are so much smaller. This will keep them moist and give them the best chance of establishing. For those that have been enquiring about readymade Terrarium Kits. We’re happy to report that we have tracked down a number of excellent versions on Etsy. You can select from fairy gardens plus a host of other types. Check them out here. Here’s a very handy Infographic from Desima which shows you how to choose the right container for your Terrarium. Remember that if it is a closed container it will require less maintenance. An open container will require regular misting. There are a list of suggested plants for you to consider including Maidenhair Ferns and Baby’s Tears. It’s also very important to ensure that you don’t place your Terrarium in direct sunlight, you don’t want to cook your plants! Be sure that it is a protected and well lit location. Better Homes and Gardens have put together a list of the Top 11 Terrarium Plants and it will definitely come in handy. Be sure to Pin this one. This Infographic shows you the preferred plant choices for your Terrarium. We were surprised to see that Cacti is not ideal as over time the moist conditions can lead to rot. A more suitable alternative are Air Plants. They require a 20 to 30 minute soak 1-3 times a week. Rooted Plants are also a great choice as they enjoy humid conditions and require very little water. Succulents fit this category. 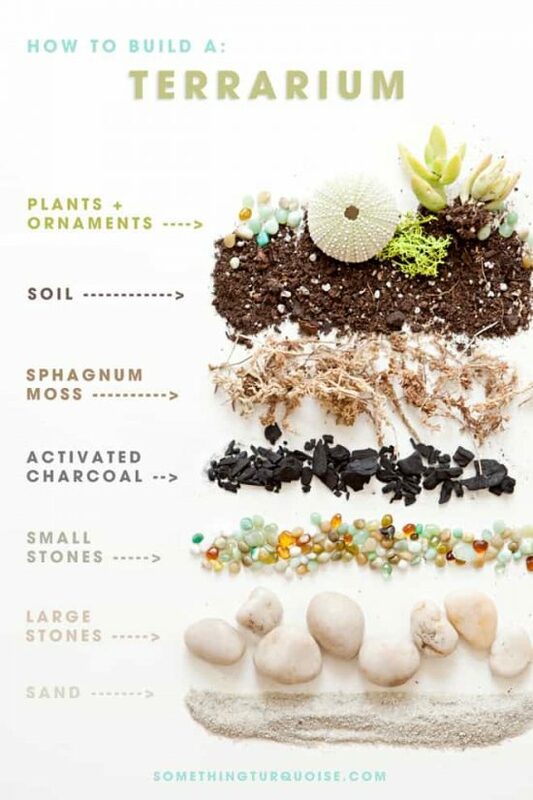 ‘Something Turquoise’ have put together a great Infographic that shows you how to build a Terrarium from the ground up. You can see that the base is sand and then you add a layer of large stones followed by small stones. Your activated charcoal then sits on top. Next, add some Sphagnum Moss and then Soil. Your plants and ornaments of your choice then are the final layer. Desima has provided another great Infographic that includes a number of tips and tricks when it comes to the construction of your Terrarium. We like the idea of using a mini spool to compact your soil. Any tool, even something like a potato masher would work well for this. Stephanie Lynn has done a great job of her Terrarium and we love the way she has angled her bowl and added some cute little legs. This is such a clever idea and gives it a very stylish look for not a lot of money. 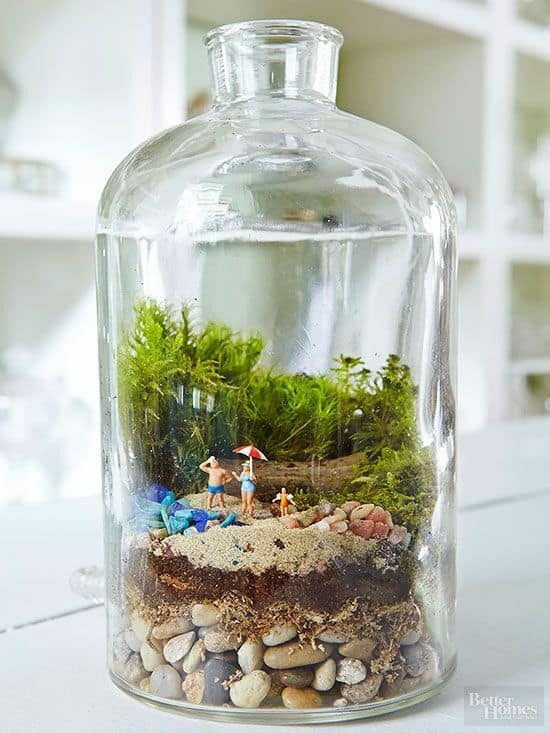 Here’s another great idea we found on Pinterest – We love the idea of using Wine Glasses to make Terrariums. This is so sweet and you could group them together in different heights as a centrepiece for your table. Here’s some more examples of containers that you can use to create different effects with your Terrariums found on the Sill site and don’t they look gorgeous. You can use simple jars right through to Coffee Plungers. Anything goes! 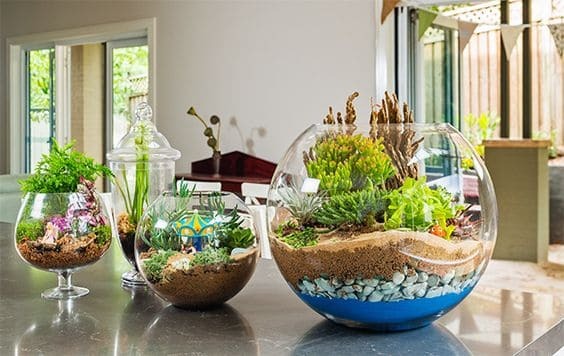 We love this Cactus Terrarium and it’s a great way to show you how to utilise an open bowl system. Don’t you just love it! Here’s another beautiful version using Succulents from Verlocal. It’s an explosion of colour and very low maintenance. Straw Bale Gardening has taken the world by storm but there is a simple secret you need to learn to get maximum effects. You need to know the process for conditioning your bale. We have a video tutorial and an excellent step by step infographic. Your garden will explode with health. Check out our post now.